Guinness's performance as Obi-Wan in the original Star Wars (1977) earned him a nomination for the Academy Award for Best Supporting Actor, the only acting nomination for a Star Wars film. Obi-Wan Kenobi is introduced in the original Star Wars living as a hermit by the name of Old Ben Kenobi on the planet Tatooine. [b] When Luke Skywalker and the droid C-3PO wander off in search of the lost droid R2-D2, Obi-Wan rescues them from a band of Tusken Raiders. At Obi-Wan's home, R2-D2 plays a recording of Princess Leia saying that R2-D2 contains the plans for the Death Star, the Galactic Empire's superweapon. Leia asks him to deliver the droid and the plans safely to the planet Alderaan in order to help the Rebel Alliance. 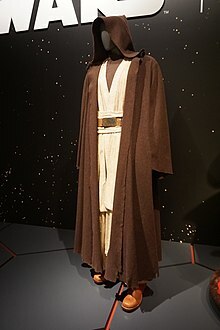 Obi-Wan reveals his true identity and explains that he is a Jedi, a member of an ancient group of Force-sensitive warriors that were hunted down and exterminated by the Empire with help from his former apprentice Darth Vader, the apparent killer of Luke's father. He gives Luke his father's lightsaber and asks him to accompany him to Alderaan and take up Jedi training. Luke declines, but after finding that his uncle Owen and aunt Beru have been killed by Imperial stormtroopers, he agrees to go with Obi-Wan to Alderaan and to train as a Jedi. In the spaceport city Mos Eisley, Obi-Wan uses the Force to trick Imperial troops into letting them through a military checkpoint. They enter a local cantina and make a deal with two smugglers, Han Solo and Chewbacca, to fly them to Alderaan aboard their ship, the Millennium Falcon. During the journey, Obi-Wan begins instructing Luke in lightsaber combat. He suddenly becomes weak and tells Luke of "a great disturbance in the Force". Emerging from hyperspace, the party finds that the planet Alderaan has been destroyed by the Empire, and the Falcon is attacked by an Imperial TIE Fighter. The trio chases the TIE fighter to the Death Star, and subsequently get caught in the space station's tractor beam. On board the Death Star, Obi-Wan shuts down the tractor beam, but Vader confronts him and they engage in a lightsaber duel. Obi-Wan uses the duel to distract Vader as Luke, Leia, Han and Chewbacca escape to the Falcon. Although Vader strikes Obi-Wan down, his body mysteriously vanishes the moment he dies. At the climax of the film during the Rebel attack on the Death Star, Obi-Wan speaks to Luke through the Force to help him destroy the Imperial station. In Return of the Jedi, Obi-Wan again appears to Luke after Yoda's death on Dagobah. Obi-Wan acknowledges that Darth Vader is indeed Luke's father, revealed by Vader himself in the previous film and confirmed by Yoda on his deathbed, and also reveals that Leia is Luke's twin sister. After the Rebels destroy the second Death Star and defeat the Empire, Obi-Wan appears at the celebration on Endor, alongside the spirits of Yoda and the redeemed Anakin Skywalker (Vader's former Jedi self). In Star Wars: Episode I – The Phantom Menace, set 32 years before A New Hope, a 25-year-old Obi-Wan Kenobi appears as the Jedi Padawan (or student) of Jedi Master Qui-Gon Jinn. He accompanies his master in negotiations with the corrupt Trade Federation, which is blockading the planet Naboo with a fleet of spaceships. After they are attacked by battle droids and forced to retreat to Naboo, Obi-Wan and Qui-Gon rescue Naboo's Queen Padmé Amidala through the help of native Gungan Jar Jar Binks and escape in a spaceship toward Coruscant, the Republic capital. Their ship is damaged in the escape, however, and they are forced to land on Tatooine, where they discover the nine-year-old slave Anakin Skywalker. Qui-Gon believes the boy is the "chosen one" prophesied to bring balance to the Force, and brings him to Coruscant to begin Jedi training, although Obi-Wan expresses concerns. While leaving Tatooine, they are attacked by Darth Maul, a member of the Sith, a dark side-using cult long thought extinct. When Qui-Gon and Obi-Wan return to Naboo to defeat the Trade Federation, they are met again by Maul, who engages them both in lightsaber combat. When Maul mortally wounds Qui-Gon, Obi-Wan rushes to fight Maul, who nearly kills him. However, Obi-Wan manages to turn the tables and defeat Maul, slicing him in half and sending him plunging down a vast reactor shaft. He promises to fulfill Qui-Gon's dying wish of training Anakin as a Jedi, with or without the Council's blessing. Yoda proclaims Obi-Wan a Jedi Knight and reluctantly allows him to take Anakin on as his own Padawan. In Episode II: Attack of the Clones, set 10 years later, Obi-Wan is now a respected Jedi knight and the master of Anakin Skywalker. Over the years, Anakin has grown powerful but arrogant, and believes Obi-Wan is "holding him back". After they save Padmé, now a senator, from an assassination attempt, Obi-Wan goes on a solo mission to trace the bounty hunters involved to the planet Kamino, where he learns of a massive clone army that the planet's inhabitants are building for the Republic. He is introduced to bounty hunter Jango Fett, the clones' template, and the two fight after Obi-Wan deduces that Fett must be behind the attempted assassination. Fett escapes to the planet Geonosis with his clone son Boba, with Obi-Wan in pursuit. On Geonosis, Obi-Wan discovers that a conspiracy of star systems bent on secession from the Republic is led by Jedi-turned-Sith Lord Count Dooku, Qui-Gon's old master. After sending a message to Anakin, Obi-Wan is captured, interrogated, and sentenced to death by Dooku. Anakin and Padmé arrive with a cadre of Jedi and the clone army, just in time to prevent the executions. Obi-Wan and Anakin confront Dooku during the ensuing battle, but the Sith lord defeats them in a lightsaber duel. Yoda intervenes and saves their lives, at the cost of Dooku's escape. In Episode III: Revenge of the Sith, set three years later, Obi-Wan Kenobi is a member of the Jedi Council and a General in the Army of the Republic. Jedi Knight Anakin Skywalker remains Obi-Wan's partner, and the two have become war heroes and best friends. The film opens with the two on a rescue mission to save the kidnapped Supreme Chancellor Palpatine from Separatist commander General Grievous onboard his starship. Count Dooku discovers the attempt and fights the Jedi, knocking Obi-Wan unconscious; while Obi-Wan is out cold, Anakin defeats Dooku and executes him on Palpatine's orders. Soon after returning to Coruscant, Obi-Wan is called away to the planet Utapau to track down the escaped Grievous. After finding the Separatist encampment, Obi-Wan fights Grievous and eventually kills the cyborg using his enemy's own blaster. When Palpatine — who is secretly the Sith Lord Darth Sidious, the mastermind of the war — issues Order 66 to have the clone troopers turn on the Jedi, Obi-Wan survives the attempt on his life and escapes, rendezvousing with Yoda and Senator Bail Organa of Alderaan aboard Organa's ship Tantive IV. Returning to Coruscant, he and Yoda discover that every Jedi in the Jedi Temple has been murdered. After sending a beacon to all surviving Jedi to scatter across the galaxy and remain in hiding, a heartbroken Obi-Wan watches security footage revealing that it was Anakin — who is now Sidious' Sith apprentice Darth Vader— who led the slaughter. Yoda says he will confront Sidious, and charges Obi-Wan with fighting Vader. Obi-Wan is loath to fight his best friend, but reluctantly accepts. Obi-Wan visits Padmé to learn of Vader's whereabouts, and realizes that Vader is her husband and the father of her unborn child. When Padmé sets out to the volcanic planet Mustafar to confront her husband herself, Obi-Wan secretly stows away in the ship. After they arrive on Mustafar, Obi-Wan reveals himself and confronts Vader, who accuses Padmé and Obi-Wan of conspiring against him and uses the dark side to choke Padmé into unconsciousness. After a long and ferocious lightsaber duel, Obi-Wan defeats Vader by severing his legs and left arm; as Vader catches fire beside a lava river, Obi-Wan takes his former friend's lightsaber and leaves him to die. Unknown to Obi-Wan, Vader is rescued by Palpatine and reconstructed into the cyborg first seen in the original trilogy. Obi-Wan takes Padmé to a remote asteroid belt, where she dies after giving birth to twins Luke and Leia. Afterwards, Yoda instructs Obi-Wan to give Luke to his uncle Owen and aunt Beru on Tatooine, and reveals that Qui-Gon's spirit has returned from the Force to continue Obi-Wan's training. Obi-Wan hands Luke off to his family and goes into exile on Tatooine. In The Force Awakens, set 30 years after Return of the Jedi, the protagonist Rey hears Obi-Wan's voice when she touches the lightsaber that previously belonged to Luke. Obi-Wan calls out to Rey, before saying the words of encouragement he gave to Luke during his training on the Millennium Falcon: "These are your first steps." James Arnold Taylor first recorded the lines for this scene, but his recordings were replaced with Ewan McGregor's voice acting. In Star Wars: The Last Jedi, Luke indirectly mentions Obi-Wan while talking with Rey. Obi-Wan is referenced indirectly in the 2016 film Rogue One. Mon Mothma has a conversation with Senator Bail Organa in which they discuss delivering the plans for the Death Star to a Jedi Knight who went into hiding after the fall of the Republic; it is implied that they are talking about Obi-Wan. Obi-Wan Kenobi is a main character in the animated micro-series Star Wars: Clone Wars and the CGI animated series Star Wars: The Clone Wars, voiced by James Arnold Taylor. In both series, Obi-Wan is a general in the Clone Wars, and he and Anakin have many adventures fighting the Separatists. The latter series highlights his numerous confrontations with General Grievous, his adversarial relationship with Dark Jedi Asajj Ventress, his romance with Duchess Satine Kryze, and the return of his old enemy Darth Maul. In Star Wars Rebels, set five years before A New Hope, Obi-Wan appears as a hologram in the pilot episode "Spark of Rebellion". In the Season 3 episode "Visions and Voices", protagonist Ezra Bridger discovers that Obi-Wan is alive on Tatooine; Obi-Wan's old nemesis Darth Maul finds him as well. In the episode "Twin Suns", Obi-Wan mortally wounds Maul during one final lightsaber duel; with his dying breath, Maul asks Obi-Wan if he is protecting the "Chosen One", and Obi-Wan replies that he is. After Maul's death, Obi-Wan is seen watching over Luke Skywalker from a distance. In Rebels, Obi-Wan was voiced by Stephen Stanton, who replaced James Arnold Taylor. Rebels creator Dave Filoni, who worked with the character during the full duration of Star Wars: The Clone Wars, said he considered asking McGregor to reprise and voice the role. Obi-Wan Kenobi appears briefly in the novel Dark Disciple, based on unfinished episodes from The Clone Wars. In the novelization of The Last Jedi written by Jason Fry, Obi-Wan tells a dying Luke to "let go" from the Netherworld of the Force. The Marvel Comics five issue mini-series Obi-Wan and Anakin focuses on the title characters between The Phantom Menace and Attack of the Clones. In the Star Wars main comic series, Luke Skywalker goes to Obi-Wan's abandoned house on Tatooine, and finds his diary. In April 2014, most of the licensed Star Wars novels and comics produced since the original 1977 film Star Wars were rebranded by Lucasfilm as Star Wars Legends and declared non-canon to the franchise. Obi-Wan Kenobi appears extensively in the Star Wars expanded universe of comic books and novels. Obi-Wan's life prior to The Phantom Menace is portrayed mostly in Jude Watson's Jedi Apprentice and Jedi Quest series. The Jedi Apprentice books follow his adventures as Qui-Gon's Padawan. Notable events in the series include battling the Dark Jedi Xanatos and going on his first independent mission. The Jedi Quest books detail his adventures with Anakin in the years leading up to Attack of the Clones. His heroism just before and during the Clone Wars is portrayed in novels such as Outbound Flight, The Approaching Storm, and The Cestus Deception. Obi-Wan's life between Revenge of the Sith and A New Hope is portrayed mostly in Jude Watson's The Last of the Jedi series. Set roughly a year after the fall of the Republic, the series follows Obi-Wan as he seeks out possible survivors of the Great Jedi Purge, most notably Anakin's former rival, Ferus Olin. The books also portray Obi-Wan adjusting to life as a hermit on Tatooine and quietly watching over Luke. He also discovers that Vader is still alive after seeing him on the Holonet, the galaxy's official news source. Obi-Wan appears in the final chapter of Dark Lord: The Rise of Darth Vader, set just after the events in Revenge of the Sith. He is also the protagonist in John Jackson Miller's novel Star Wars: Kenobi, which takes place during his exile on Tatooine. Obi-Wan appears in spirit form in many novels set after Return of the Jedi. In The Truce at Bakura, he appears to Luke to warn him about the threat presented by the Ssi-ruuk; in The Lost City of the Jedi, he guides Luke to the titular city on Yavin IV; in Heir to the Empire, meanwhile, he bids farewell to Luke, explaining that he must abandon his spiritual form to "move on" to a new, higher plane of consciousness. Before parting, Luke says that Obi-Wan was like a father to him, and Obi-Wan replies that he loved Luke like a son. Obi-Wan Kenobi appears in several video games. He is a playable character in all four Lego Star Wars video games, as well as Battlefront II and Renegade Squadron. He is also the lead character in Star Wars: Obi-Wan. The older version is only playable in Lego Star Wars II: The Original Trilogy and Star Wars: The Complete Saga, and Star Wars Episode III: Revenge of the Sith multiplayer mode and Death Star bonus mission Star Wars: Renegade Squadron, and Star Wars: The Force Unleashed in multiplayer mode and the droid PROXY disguises as him. He also appears in Star Wars: The Clone Wars – Jedi Alliance, Star Wars: Jedi Power Battles and Star Wars: The Clone Wars – Lightsaber Duels as a playable character. He is also playable in the strategy game Star Wars: Empire at War. He is a playable character in Disney Infinity 3.0. Kenobi has also been confirmed to be a playable character as part of a scheduled Clone Wars season for Star Wars Battlefront II. In the comic book series Star Wars: Republic, Obi-Wan Kenobi faces many grave threats while fighting against the Separatists. Among other notable storylines, he is kidnapped and tortured by Asajj Ventress before being rescued by Anakin ("Hate & Fear"), and apprehends corrupted Jedi Master Quinlan Vos ("The Dreadnaughts of Rendili"). Throughout the series, he grows increasingly wary of Palpatine's designs on the Republic and his influence on Anakin. In the non-canon story "Old Wounds", set a few years after the events of Revenge of the Sith, Obi-Wan confronts Darth Maul on Tatooine to protect Luke. The duel ends when Owen Lars shoots and kills Maul; he then warns Obi-Wan to stay away from his nephew. Through the Force, Obi-Wan reassures Luke that he will be there for him when needed. In August 2017, it was rumored that there were plans for a stand-alone Star Wars movie about Obi-Wan directed by Stephen Daldry, although nothing has been officially announced. Ewan McGregor has said that he would be open to reprising the role of Obi-Wan, though knew of no plans for him to do so. In December 2017, it was reported that an Obi-Wan Kenobi anthology film was eying a potential January 2019 production start date. On May 17, 2018, entertainment website TMZ reported that the next Star Wars anthology film would be Kenobi: A Star Wars Story, produced under the working title "Joshua Tree", with Stephen Daldry directing. According to TMZ, the movie would take place a few years after the fall of the Republic shown in Episode III, when marauding Tusken Raiders and an evil warlord bring Obi-Wan out of hiding to protect Luke Skywalker and some farmers. Former UK Foreign Secretary Boris Johnson was quoted as saying the filmmakers of an Obi-Wan spin-off film had proposed shooting it in Northern Ireland. It was voted as the most wanted anthology film in a poll by The Hollywood Reporter. The character is loosely inspired by General Makabe Rokurōta, a character from Akira Kurosawa's film The Hidden Fortress, played by Toshiro Mifune (whom series creator George Lucas also considered casting as Obi-Wan). Mad magazine parodied the original film under the title Star Roars and included a character named 'Oldie Von Moldie', a grizzled 97-year-old whose lightsaber runs on an extension cord. The Shanghai nightclub shown in the beginning of Indiana Jones and the Temple of Doom is called "Club Obi Wan" (Lucas wrote both the Star Wars and Indiana Jones series). A real bar/club by this name existed in the Xihai district of Beijing, China but closed in the summer of 2010. The Super Mario Bros. Super Show! episode "Star Koopa" (a spoof of Star Wars) also had its own parody of Obi-Wan called 'Obi-Wan Toadi', and the live-action segment "Zenned Out Mario" featured a parody called "Obi-Wan Cannoli". The 1998 Animaniacs episode "Star Warners" (which spoofed Star Wars) featured Slappy Squirrel portraying a parody of Obi-Wan as 'Slappy Wanna Nappy'. In the Family Guy episode "Blue Harvest", Obi-Wan Kenobi is parodied by the character Herbert. In the short film Thumb Wars, Obi-Wan is parodied as the character "Oobedoob Benubi". In the film, his full name is 'Oobedoob Scooby-Doobi Benubi, the silliest name in the galaxy.' In the 1977 Star Wars parody Hardware Wars, Obi-Wan is parodied by the character "Augie Ben Doggie". The TV Tropes website uses Obi-Wan's name for the archetype mentor figure. Guinness received an Academy Award for Best Supporting Actor nomination for his portrayal of Obi-Wan Kenobi. In the parody song "The Saga Begins", released approximately one month after the release of Star Wars: Episode I – The Phantom Menace, "Weird Al" Yankovic sings a humorous summary of the plot of that film from Obi-Wan's perspective, to the tune of the song "American Pie." 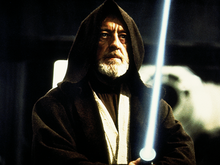 In 2003, the American Film Institute selected Obi-Wan Kenobi as the 37th greatest movie hero of all time. He was also listed as IGN's third greatest Star Wars character, as well as one of UGO Networks's favorite heroes of all time. In 2004, the Council of the Commune Lubicz in Poland passed a resolution giving the name "Obi-Wan Kenobi" to one of the streets in Grabowiec, a small village near Toruń. The street was named in 2005. The spelling of the street name, Obi-Wana Kenobiego is the genitive form of the noun in the Polish language: (the street) of Obi-Wan Kenobi. The Guardian cartoonist Steve Bell portrayed Jeremy Corbyn, current leader of the British Labour Party, as Obi-Wan Kenobi. ^ George Lucas named the planet in an interview with Jon Stewart at Star Wars Celebration V; it was later acknowledged by official sources. ^ In an early draft of the film, his first meeting with Luke is lifted directly from The Hobbit, acknowledging Gandalf as a source of inspiration. ^ Burton, Bonnie; Vilmur, Pete (August 14, 2010). "Star Wars Celebration Main Event: Play by Play". StarWars.com. Archived from the original on September 3, 2011. Retrieved January 1, 2019. ^ "Obi-Wan Kenobi - Info, Pictures, and Videos". StarWars.com. Archived from the original on December 31, 2013. Retrieved January 1, 2019. ^ "Star Wars: Q: Where's Obi-Wan's home ..." Official Star Wars Twitter. Twitter. August 14, 2010. Retrieved 2010-09-20. ^ "The best 'Star Wars' memes". dailydot.com. ^ Taylor, Chris (2015). How Star Wars Conquered the Universe: The Past, Present, and Future of a Multibillion Dollar Franchise. Performing Arts. p. 96. ^ "Star Wars: The Empire Strikes Back Script at IMSDb". Imdsb.com. Retrieved September 18, 2013. ^ "Star Wars: Return of the Jedi Script at IMSDb". Imsdb.com. 1981-12-01. Retrieved 2013-09-18. ^ "The Phantom Menace Script". Blueharvest.net. Archived from the original on September 18, 2008. Retrieved October 5, 2008. ^ Brooks, Terry (1999). Star Wars Episode I: The Phantom Menace Novelization. London, England: Del Ray Books. ISBN 0-345-43411-0. ^ Salvatore, R.A. (2003). Star Wars Episode II: Attack of the Clones novelization. London, England: Del Ray Books. ^ Taylor, James Arnold [@JATactor] (19 December 2015). "yes, it was me originally but they replaced my version with Ewan. I guess if I'm gonna be replaced it should be him!" (Tweet) – via Twitter. ^ O'Callaghan, Lauren (24 March 2017). "Every Star Wars: Rogue One Easter egg we could find". Games Radar. Future Publishing Limited. Retrieved 16 July 2018. ^ Goldman, Eric (December 11, 2016). "Star Wars Rebels: "Visions and Voices" Review". IGN. San Francisco, California: J2 Global. Retrieved November 10, 2017. ^ Goldman, Eric (March 18, 2017). "Star Wars Rebels: "Twin Suns" Review". IGN. San Francisco, California: J2 Global. Retrieved November 10, 2017. ^ Star Wars (18 March 2017). "Rebels Recon #3.20: Inside Twin Suns - Star Wars Rebels". YouTube. Retrieved 10 November 2017. ^ Anderton, Joe (4 January 2017). "Obi-Wan will fight Darth Maul in Star Wars Rebels". Digital Spy. London, England: Hearst Magazines UK. Retrieved 10 November 2017. ^ Tveit, Elaine (May 21, 2016). "Dave Filoni Wants Ewan McGregor To Voice Obi Wan On Star Wars Rebels". Dorkoftheforce.com. Retrieved November 10, 2017. ^ "The Playlist: A Guide to Obi-Wan Kenobi's Biggest Moments". StarWars.com. 2016-09-27. Retrieved 2016-12-20. ^ Campbell, Evan (September 19, 2016). "Yoda's Pre-Phantom Menace History Will Be Revealed in Marvel's Star Wars Comic". IGN. San Francisco, California: J2 Global. Retrieved December 20, 2016. ^ Kane, Alex (June 9, 2018). "Obi-Wan Kenobi, General Grievous, Anakin Skywalker Coming to 'Battlefront II'". Variety. Los Angeles, California: Penske Business Media, LLC. Retrieved June 10, 2018. ^ "Star Wars Battlefront 2: New Clone Wars Content and Heroes Coming to Game". Den of Geek. New York City: Dennis Publishing. June 9, 2018. Retrieved June 10, 2018. ^ Perry, Spencer (August 17, 2017). "Standalone Obi-Wan Kenobi Movie in Development with Director Stephen Daldry". Coming Soon. Retrieved August 22, 2017. ^ Kit, Borys (August 17, 2017). "'Star Wars' Obi-Wan Kenobi Film in the Works (Exclusive)". Msn.com. Retrieved November 10, 2017. ^ Kitchener, Shaun (August 3, 2018). "Star Wars: Obi-Wan Kenobi's Ewan McGregor finally gives UPDATE on solo movie". Daily Express. Retrieved August 24, 2018. ^ "Obi-Wan Kenobi film set to join Star Wars universe". The Guardian. London, England: Guardian Media Group. August 17, 2017. Retrieved November 10, 2017. ^ Keene, Allison (April 29, 2016). "Ewan McGregor Clarifies Status of an Obi-Wan Kenobi Solo Film". Collider. Retrieved August 11, 2016. ^ Guerrasio, Jason (March 18, 2017). "Ewan McGregor is still up to play Obi-Wan Kenobi again: 'It would be fun to do'". Business Insider. New York City: Axel Springer SE. Retrieved November 10, 2017. ^ Marc, Christopher (December 10, 2017). "Lucasfilm Eyeing Early 2019 Production Start On 'Kenobi' Anthology Film". Omega Underground. Retrieved December 10, 2017. ^ "Obi-Wan Kenobi 'Star Wars Story' Movie Has Its Plot and Director". TMZ. May 17, 2018. Retrieved 1 January 2019. ^ Jirak, Jamie (November 24, 2018). "Former UK Foreign Secretary Claims George Lucas Plans to Shoot Star Wars Spinoff Obi-Wan Kenobi Movie". ComicBook.com. Retrieved November 25, 2018. ^ Couch, Aaron; McMillan, Graeme (August 26, 2016). "Darth Vader Deserves a 'Star Wars' Spinoff (But Not Everyone Agrees)". The Hollywood Reporter. Los Angeles, California: Eldridge Industries. Retrieved November 10, 2017. ^ Enk, Bryan (January 14, 2013). "'Seven Samurai' star Toshiro Mifune: The would-be face of Darth Vader?". Yahoo.com. Retrieved December 24, 2015. ^ "The Obi Wan - Television Tropes & Idioms". TV Tropes. Retrieved December 27, 2010. ^ "Obi-Wan Kenobi is #3". IGN. San Francisco, California: j2 Global. Retrieved December 6, 2010. ^ "Gerald Home and Lucasfilm's letter to BFSW". YouTube. 2008-05-13. Retrieved 2015-12-24. ^ "An interview with Leszek Budkiewicz, who lives on the street, and who (being the Council member himself) managed to convince the Council to name the street after Obi-Wan Kenobi". Starwars.pl. Archived from the original on 2013-07-30. Retrieved September 18, 2013. ^ Bell, Steve (September 29, 2015). "Steve Bell's If... Labour's Obi-Wan Kenobi Corbyn gives a dire warning". The Guardian. London, England: Guardian Media Group. Retrieved December 24, 2015. Soule, Charles (2016). Checchetto, Marco (ed.). Star Wars: Obi-Wan and Anakin. Marvel Entertainment. p. 112. ISBN 9781302489342.